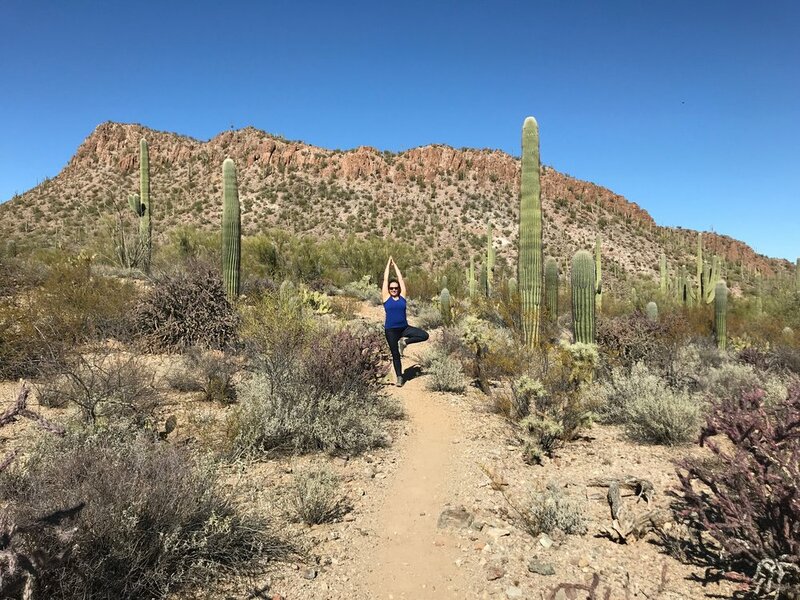 In January, I spent eight days in Tucson, Arizona completing the first part of a certification process to become a LifeForce Yoga practitioner- which is yoga for mood management. For a long time now, I have known that my calling as a yoga teacher is to be a companion and guide on the journey one takes back to themselves. I am less interested in breaking a sweat, and a lot more interested in breaking habits that keep us in a state of 'samskara'. I have explored many paths in my 39 years and wouldn't you know, here I am on the path that was always there- plain as day- as my dharma. My parents were both in the mental health field. My father, who passed away in 2013 was a child psychiatrist. My mom, who is still practicing, is a marriage and family therapist who trained and mentored with Murray Bowen, the famous family systems theorist. I grew up in a house where feelings were expressed and discussed and treated with much import. My dad would often ask me, how is your heart? And this was normal. As an introvert and natural-born skeptic, I resisted the talk therapy aspect of what my parents did and there was quite a bit of eye rolling amongst my siblings and I over the years as we met for family meetings, linked together family diagrams, celebrated rites of passage that other families didn't, met for family dinner in which our private, inner worlds were fair game for inquiry. I ran in the other direction for many years denying my roots and looking, seeking for anything else that would fulfill my life's purpose. I was a baker, an artist, a journalist turned creative writer, a minimalist, a secretary, and had so, so many temp jobs over the years. When I discovered yoga, I immediately knew it was my true calling. It didn't involve the probing and prodding of talk therapy to help one recover a sense of wholeness and wellness. I took the leap and became a yoga teacher and shortly thereafter, opened Bodhi Yoga, LLC (currently DBA 'Yoga W/ Marca'). Over the years as a teacher and yoga studio owner I have had to wear many hats and often times in the business of meeting the needs of the customer, felt the need to be the right yoga teacher for everybody. Not until recently have I begun to focus that lens and not only understand but embrace the role of yoga teacher teaching only from where my heart truly resides; I teach to support mental health. I teach to restore balance to the time traveling mind that when anxious, likes to speed up and when depressed, likes to slow waaaaaay down. With this understanding of who I am as a yoga teacher, I sought out a program to further educate me on using yoga to work with mental health and mood issues. Amy Weintraub, author of Yoga For Depression has been on my bookshelf since- not shockingly- my mom bought it for me in 2003 when it was published. It is well-worn and has been a favorite reference of mine over the years in teaching and on my own mental health journey. So when I searched for training programs last October and discovered Amy Weintraub's LifeForce Yoga Training Program for mood management, I was beyond elated and quickly figured out a way to set out on this path. In training I met many wonderful yoga teachers and therapists and learned from three very thoughtful, emotionally intelligent leaders; Amy Weintraub (founder of LifeForce Yoga), Rose Kress (new owner of LifeForce Yoga), and Randy Todd (clinical social worker in Tucson, AZ VA hospital who uses the LifeForce Yoga techniques in group settings to help those with depression, anxiety, and PTSD). What's in the LifeForce Yoga toolbox, you ask? It's a wonderful combination of things, including breathing techniques, gentle yoga postures, chakra clearing exercises (chakras are the major energy vortices in the body), visualizations, meditations, toning (making sound), and using mudras (hand configurations to direct energy). Since my return to Wisconsin, I have been eager to begin working with those who could benefit from these profoundly effective tools and teachings. I have put together the first workshop (of many more, I hope) "Yoga for Anxiety & Depression" on 4/28/18. In my opinion, these teachings can benefit everyone as I believe we all suffer on some level from anxiety and depression and the at least occasional feeling that we are controlled by the fluctuations of our moods. In the workshop we will learn to restore balance to the depressed mood, the anxious mood and a combination of the two. And we will gain the tools needed to always navigate back to the true, unfettered, unobstructed self. To learn more about the upcoming workshop, GO HERE.